The first phase of the new Sandy Creek Sporting Grounds has opened at Reynolds Lake Oconee. 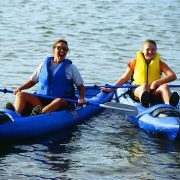 The Sporting Grounds offers a variety of outdoor experiences at the award-winning community which is set on 12,000 acres on Lake Oconee 75 miles east of Atlanta. Named for the stream that flows into Lake Oconee and shapes the property’s topography, Sandy Creek Sporting Grounds is under the design direction of international shooting champion Justin Jones of Great Britain. Jones is one of the world’s foremost experts in the development and management of elite resort shooting facilities. The Sporting Grounds complex encompasses nearly 100 acres and features a 20-station sporting clays course, five-stand shooting range and air rifle facility, as well as archery and instructional/games areas and a hiking course. A guest center will be adjacent to the existing, 1800s-era Sandy Creek Barn and a 40-acre lake. Instruction at the 20-station sporting clays course will set you straight. If you are not a shooter, no problem. There is an endless list of exciting outdoor activities, including fishing, kayaking, canoeing, and hiking. The Sandy Creek Sporting Grounds project is the latest in a multi-million-dollar improvement plan designed to touch nearly every facet of the Reynolds Lake Oconee community and resort. The aesthetic of the 20-station Sporting Clays course is created much like a golf course. The clays course is laid out in a series of stations (holes) with each specifically designed to offer shot variation of length, angle and trajectory. The track emulates the unpredictable and challenging nature of a classic British shoot, with clays launched at a variety of speeds, trajectories, angles, elevations and distances. Certified instructors will be available for lessons, and a personal guide will accompany guests through all activities. Shooters on the sporting clays course will traverse the course in a specially-outfitted sporting clays buggy. Reynolds Lake Oconee has 117 holes of golf, all designed by legendary golf architects, including Jack Nicklaus, Rees Jones and Tom Fazio. Beyond the “Top 100” ranked golf courses and additional sporting activities, the Reynolds community offers a wide array of recreational opportunities along the more than 350 miles of Lake Oconee shoreline. Vacation guests at Reynolds can choose from individual cottages within the private gates, while enjoying a variety of amenities. Accommodations also are available at The Ritz-Carlton. A variety of vacation packages, some incorporating golf and shooting, will be available.